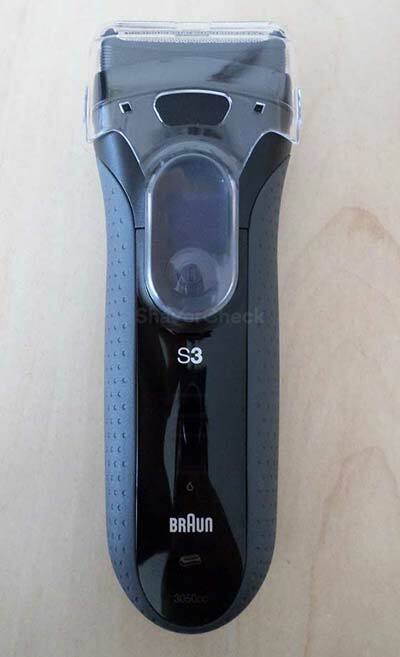 The 3050CC is yet another variation of the new Series 3 ProSkin line of affordable electric razors from Braun. With a reasonable price and some compelling features, this particular razor is bound to become a very popular choice in the highly competitive segment of entry-level electric shavers. Moreover, this particular model also comes with an automatic cleaning and charging station. Without further ado, let’s see how the Braun 3050CC performed in our review. Wrapup — Who should buy the 3050cc? Braun has launched quite a few variations of the Series 3. While they’re all pretty much identical in terms of shaving performance, the differences — included accessories, the presence of locking mechanisms or popup trimmers, dry only or wet & dry use — can make one model more suitable than others in certain situations. 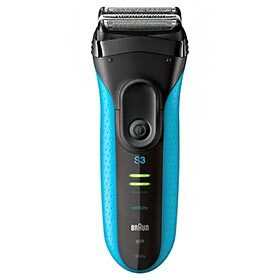 The Braun Series 3 ProSkin 3050CC is an electric shaver that can only be used for dry shaving, so it caters to this specific segment; the CC part from its name stands for Clean & Charge, meaning the razor comes with a base for automatically cleaning and charging. The shaving head of the 3050CC is the same as in the case of the Series 3 3040s that we reviewed a while back and it’s comprised of three cutting elements. The two outer foils are used for cutting hairs close to the skin, while the middle trimmer features slots for cutting longer hairs and a microcomb that guides the hairs into the slots. 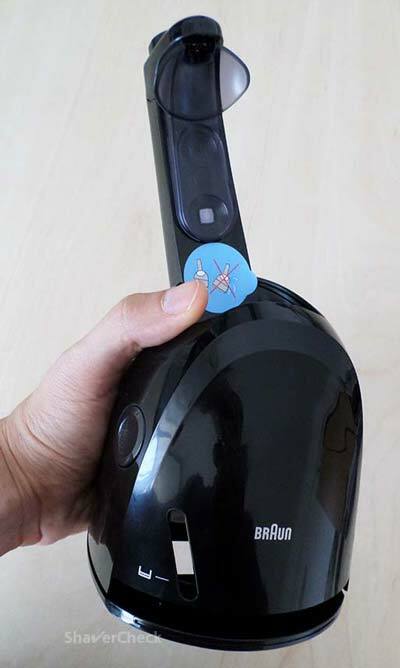 Other noteworthy features are: an integrated pop-up trimmer, charging and cleaning notification LEDs, 5-minute quick charge function, cordless operation for up to 45 minutes. Since the 3050CC is not designed to be used for wet shaving, you can also shave with the device plugged in. This is a welcome feature that will be useful when you’re in a hurry and can’t even afford 5 minutes for a quick charge. Or when the battery will no longer hold a decent charge. The 3050CC feels light and solid in the hand. The girth of the body is substantial and it doesn’t taper towards the middle like in the case of Panasonic shavers for example. However, this doesn’t seem to impact the ergonomics in any noticeable way. The light weight of the razor and the generous rubbers inserts provide excellent grip. The color scheme of my review unit was pretty lackluster, consisting of dark grey and black. There is also a variant of the 3050CC with red and black. I don’t find the design of the 3050CC particularly exciting, but I can’t say I don’t like it. Overall, it looks and feels like a quality product. There’s no dedicated travel lock on the 3050cc or on any of the Series 3 ProSkin models. However, as you can see in the image above, the protective cap extends over the ON/OFF switch, which kind of works as a travel lock. The popup trimmer is conveniently placed and easy to use for touch-ups and trimming your sideburns. I wouldn’t recommend using it as a facial trimmer as it will take a lot of time and it won’t be the most comfortable experience either. A dedicated trimmer is definitely the way to go. 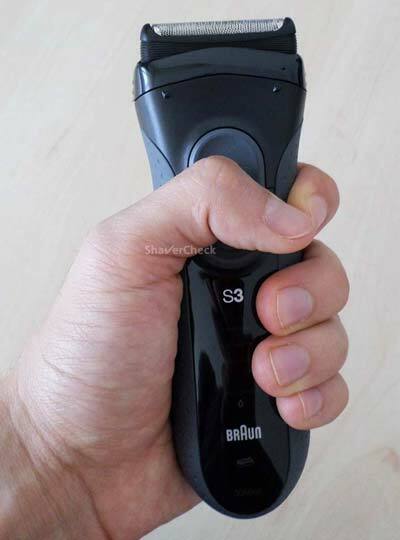 The Braun Series 3 ProSkin 3050CC can be operated both cordless and with the shaver connected to the mains. The Li-ion battery inside should provide enough power for 45 minutes of use. And after using the shaver for a couple of weeks, I can confirm that this statement is pretty accurate. There’s also a quick charge option that allows you to complete a shave after only 5 minutes of charging (when the battery is completely drained). 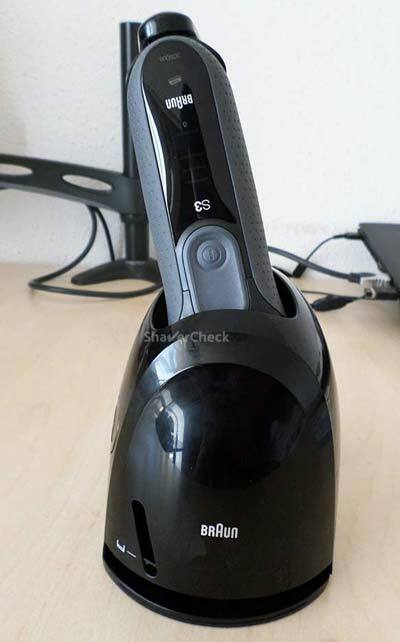 You basically have two options for charging the 3050CC: by directly plugging the cord into the shaver or by placing the razor in the charging dock. However, this will also start a cleaning cycle. And this is probably the only real drawback of the station that comes with the 3050. Unlike the ones from the Series 5, 7 or 9, you don’t have the option to only charge the razor if you choose so. 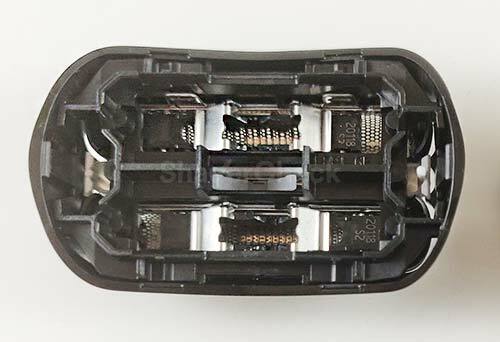 The clean & charge stations from the superior lines mentioned above charge the razors by aligning the two metal prongs from the back of the razors with two small metal plates in the station. The Series 3 shavers that come with a cleaning base lack this feature. 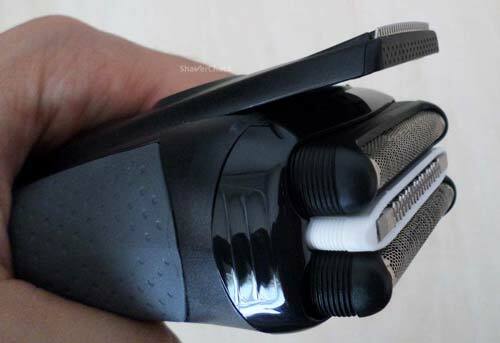 Therefore, if you simply place the shaver into the base nothing will happen. You must press the release/lock button on the top of the station to start the charging & cleaning process. Unfortunately, you can’t have just one or the other. One of the main selling points of the Series 3 ProSkin 3050CC will most likely be the inclusion of a Clean & Charge station in this price category. And we’ll get to it right away. But first, I have to mention that you can also perform a manual cleaning. And I actually recommend doing so and only using the Clean & Charge station once or twice a week for example and save some cleaning fluid. 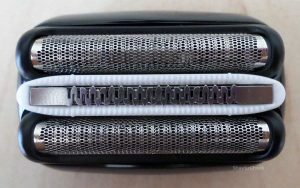 Manually cleaning the 3050CC is pretty straightforward; you can use the included brush to remove the hairs from the inner housing of the shaver (don’t use it directly on the foils) and rinse it with warm tap water. You can also put a bit of liquid soap on the foils, let it run for a while and then thoroughly rinse the head and the shaver under hot tap water. Wipe the excess water with a clean cloth let it dry completely before using it again. Because Braun uses these cassettes where the blades and foils are merged into a single piece, a manual cleaning is more time consuming compared to cleaning a Panasonic for example. You’ll have to spend a bit more time to get all the hair clippings out of the intricate shaving head. As mentioned in the previous section, the cleaning dock that comes bundled with the 3050CC is a stripped down version of the one from the Series 7. Gone are the LED level indicators and cleaning modes, along with the possibility to just charge the razor without cleaning it. The base is more compact, in the way that it has a smaller footprint when placed on your counter-top, but the protruding arm that holds the razor in place makes it less practical for traveling. The cleaning process is as simple as it gets as you don’t have any options at all. After removing the cover from the cartridge and placing it inside the base, you insert the razor upside down into the housing and press the start button on top. The cleaning cycle will start and will run for around 2 minutes. After that, the drying phase will begin and will last for 4 hours. During this time the yellow light on the shaver will flash and turn off once the cycle is complete. The drying cycle takes so long because the stations available with the Series 3 (and Series 5 as well) don’t use an active drying system, like the ones that come with the Series 7 (certain older models) or the Series 9. I recommend removing the cleaning cartridge from the base and putting back the cap when you’re not using the station. Being alcohol-based, the liquid tends to evaporate quicker than other cleaning solutions. The station does a great job at cleaning and sanitizing the razor; the solution also lubricates the blades, so there’s no need to do it yourself. Having reviewed the Series 3 ProSkin 3040s not very long ago, I pretty much knew what to expect from the 3050CC in terms of dry shaving performance. And it was no surprise that they were pretty much identical. The Series 3 3050CC provided a comfortable and smooth shave that was also pretty satisfactory with regards to closeness. I used the 3050cc daily for most of the time and this is the scenario where the shaver yields the best results. Adding a pre-shave always seems to help me get a better shave and that was the case here as well. Shaving after two days of beard growth wasn’t the best with the 3050CC as it tends to leave some longer hairs behind, especially on my neck where they lay flat on the skin. This leads to more strokes and increases shaving time. However, it was still quite a bit better than for example a Panasonic Arc 3. The razors from the Series 3 are pretty basic and can feel underpowered if you have a very heavy beard or shave irregularly. If that’s the case I recommend checking out a more powerful and advanced shaver, like the Series 5. The shaving experience with the 3050CC was pleasant for the most part and I don’t have any major complaints. Again, this is considering its price range. If I were to nitpick, I would say that for me personally shaving with a Panasonic Arc 3 for example gives me a slightly closer shave. However, the Series 3 is more comfortable, especially when used dry. Also, I only used the popup trimmer to adjust my sideburns and didn’t really like it. It took more work to effectively cut the hairs than with the previously mentioned Panasonic. It just seems dull and takes a lot of effort to capture and cut the hairs. Unfortunately, there’s no travel case included. If you really want one, you’ll have to pay a few extra dollars and buy the Series 3 3070CC, which is an identical razor but also includes a travel case. Another option would be to purchase a third-party case, there are quite a few available and will accommodate the shaver and the charging cord. All Series 3 razors use the same shaving head replacement, called a cassette. These cassettes include the foils and the blades, so they can’t be bought or replaced separately. 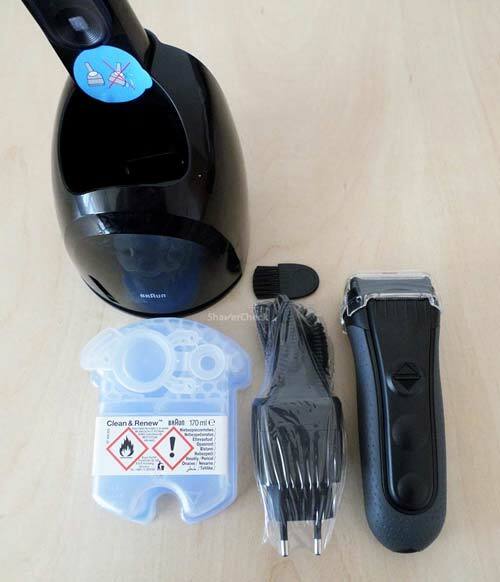 The compatible cassettes for the 3050CC are the 32b/32s parts and can be bought at a very reasonable price, making the Series 3 one of the most convenient lines of shavers with regards to costs of ownership. Moreover, these parts have to be replaced once every 18 months, which is significantly longer than the industry standard of 12 months. 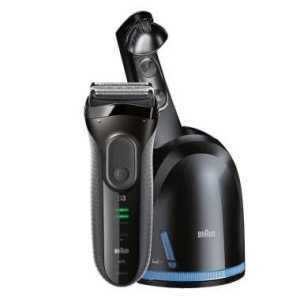 At the moment of writing, I personally don’t think you can find a better shaver at this price point that also comes with an excellent cleaning station. The 3050CC is a simple, but capable razor that will satisfy most men who are looking for a reliable shaver to be used mostly for daily shaving and also want the convenience of a cleaning station. This razor offers all of these and does so at a quite reasonable price; moreover, the replacement parts cost less than the ones from other manufacturers. Please keep in mind that the Series 3 3050CC is a dry only shaver, so while you can clean it under running water, you cannot shave with shaving cream or gel. So if you’re only interested in dry shaving, the 3050CC should be on your list of options. Being a dry only shaver with an automatic cleaning station, you know exactly what you’re getting with the 3050CC. The other two variations, namely the 3070CC and 3090CC don’t have any significant extra features to justify the price — a travel case and foil locking mechanism — so the 3050CC in this review is the more sensible choice. With that said, I only recommend buying it if you can find it at a great deal. The regular retail price is too high for this razor, especially since you can now find the Series 3 3040s at bargain prices. The Series 3 is suitable for daily shaving, but they’re definitely not the fastest razors nor do they provide the closest shaves, especially if you have a coarse beard. So your expectations must be realistic in this regard. 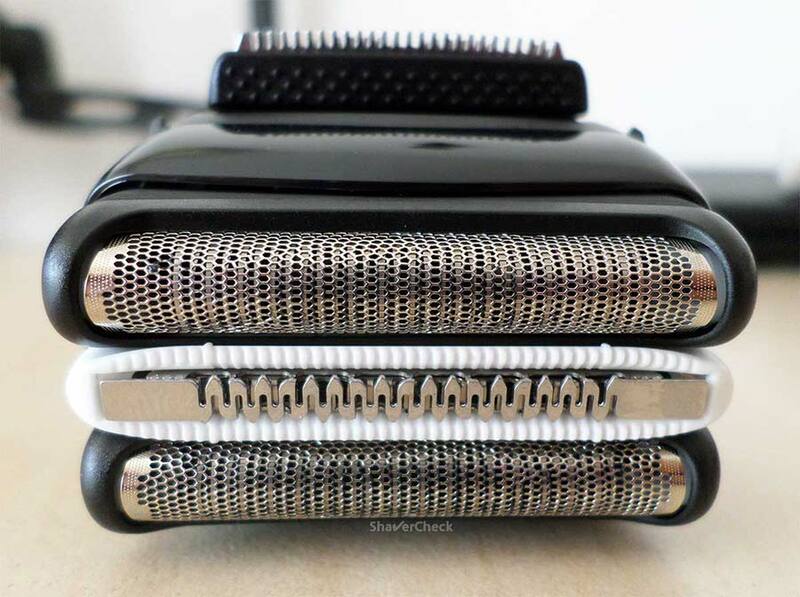 If you want a faster and closer shave, then the Series 5 or 7 will be more suitable. They are significantly more expensive, but the difference in performance is also noticeable. I just bought the shaver series 3 3050cc , it seems the charge got issue. I van only see 2 led light after so many hours change, please advise. you should definitely make use of your product’s warranty and send it back for a replacement. You are very welcome, Kevin. Considering the cost of the 32s/b cassettes in the UK you’re probably better off with buying a new shaver. Can anyone advice or help me to find the rechargeable batteries for the Braun 3050cc model? Amazon doesn’t have it, and I can’t find it on the internet. Thank you. I just purchased the Braun series 3 for shaving my head and I was surprised with the results. I got a very close shave with no nicks or burns. I would highly recommend this razor for anyone that wants a good close shave on their head. Will the 3050 razor fit in the old 350 clean and charge station? Just need the razor as the station still works perfectly. Yes, the older Series 3 stations should work seamlessly with the updated cc shavers (3050cc, 3090cc). Can i wash the shaver 3050cc under running tap water ? Is it waterproof up to 5M deep ? Yes, the 3050cc is IPX7 certified, so you can wash it without any worries. the only real difference between them is the color the wet version always blue like 3040s . so i can really use it with gel and foam with dry only like 3050cc if i isolated the bottom part from water ? The dry only operation of the 3050cc is intended as a safety precaution since it can be used while plugged in. The shaver itself is fully waterproof. 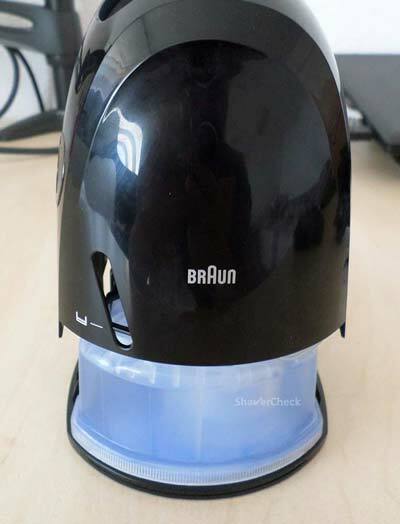 I’ve have the Braun Series 3 3050cc shaver + Clean and Charge station. The trimmer has just come off the back due to one of the plastic clips has broken off. I was wanting to know if this cleaning station is compatible with other Series 3 shavers with trimmers? The station is only compatible with Series 3 shavers that come with a cleaning station, like the 3070cc or 3090cc. It will not work with the solo models (like 3040s, 3010s etc. ).